If the front book cover of Jacqueline Kennedy, Hillary Clinton, Michelle Obama, Laura Bush, and Nancy Reagan in silver one-pieces doing the cancan is the craziest thing you have ever seen, wait until you open the book. 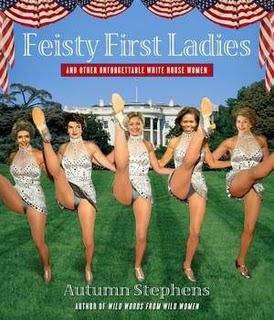 In Feisty First Ladies and Other Unforgettable White House Women, Autumn Stephens reveals stories about the United States First Ladies that you never learned in history class. Besides the information on the First Ladies, Stephens also talks about some of the infamous White House women who spiced up the United States' history. Stephens provides an in-depth look at all the women who have lived in the White House, and some of the mischief that ensued. Did you know that Dolly Madison, who famously saved the portrait of George Washington when the British army burned the White House during the War of 1812, also saved a portrait of herself? And that Alice Longworth, Theodore Roosevelt's daughter, used to have a pet snake and raise hell in Washington, D.C.? This is one of those books that you cannot put down until you are finished reading. Starting with Martha Washington and ending with Michelle Obama, Stephens covers every fact about these amazing women. Feisty First Ladies and Other Unforgettable White House Women is definitely a feminist book. Stephens points out the feminist tendencies in some of these women, as well as advancements they made for other women. Even though President Obama was only in office for a few months when this book came out, Stephens included a rave review of Michelle Obama. Of all of the profiles, Eleanor Roosevelt's stood out the most for me. I have always been a fan of hers, but this book pointed out even more what a strong woman she was. Feisty First Ladies and Other Unforgettable White House Women is a book that I have lent to the strong women in my family, and they love it just as much as I do.